Change is afoot. Mammoth change. Every conversation I have about books these days, I'm looking for the answer to the question: "What is the future of printed books?" No one is entirely sure, whether they become curios of bygone days, or succeed in holding their own as e-books and book apps take their place on the literary stage. Six months ago, I was afraid for "the book". Not so anymore. Because the one thing that everyone who answers the question is sure of is that stories will survive. So I'm going to believe there's room for both, and that readerships will only improve thanks to the online word. One can either sit on the sidelines, or park one's fears there, stride on in and find out what the opportunities are. Thinking this way, I have a feeling it's only a matter of time before I get in on the App. In the meantime, I'm learning all I can. And one mentor I'd recommend to any writer, or creator, is Crystal Stranaghan. 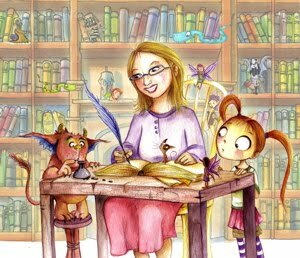 That's Crystal, above, in picturebook form (she's the one in the middle, and it's a very good likeness, done by the illustrator Izabela Bzymek!). I went to one of her presentations on the book-as-App recently, and left the session all fired up at the potential to share stories this way. Crystal has worked in both worlds, traditional print publishing and now book Apps, and she's as keen as pepper (to borrow from Emily Carr) about Apps. Learn more about her work, her books, and her workshops here.